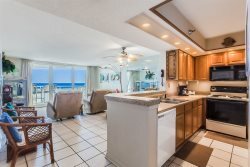 Palacio at Perdido Key offers a rare combination of comfort and value in a wonderful beachfront location. All two bedroom, two bath or three bedrooms, three bath units directly face the beach. There's a heated swimming pool with a sundeck, gazebo, and walk over to the beach. A private racquet club includes two lighted tennis courts and a gazebo. A gulf-front fitness center is also provided. World-class dining, shopping, and golf are close by.